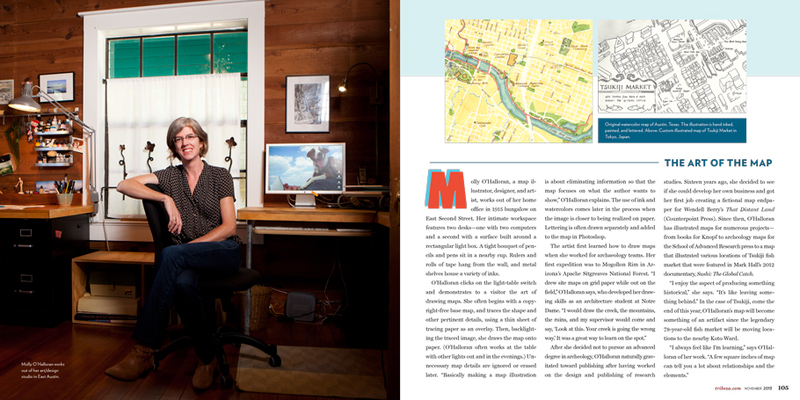 Austin’s TRIBEZA magazine featured my custom map work in their November 2013 article “Classic Crafts”. Despite a case of the jitters, it was good fun to have photographer Kenny Braun and writer S. Kirk Walsh over to the studio. We talked about my process for making hand-rendered maps and I showed them samples from the flat files of watercolor maps and pen and ink maps. These are labor-intensive processes that aren’t right for every project, but they are super satisfying to a draw-er like me. I am grateful for the magazine’s attention which I hope leads to new conversations about project ideas and for the introduction to new friends. Thanks, Tribeza, Kirk, and Kenny!